Began as a message board, Drupal today is open source software maintained and developed by a community of over 1,000,000 users and developers. Drupal is used by numerous local businesses to global corporations and diverse organizations all across the globe. 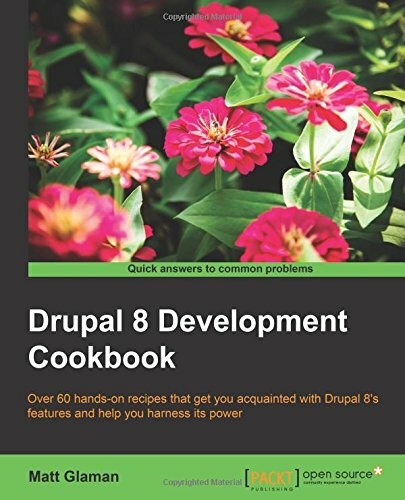 With Drupal 8’s recent release and the exciting features it brings, this book will be your go-to guide to experimenting with all of these features through helpful recipes. Matt Glaman is a developer at Commerce Guys. He is an open source developer who has been working with Drupal since 2013. He has also been developing web apps for many years prior to this. Since then, he has contributed to over 60 community projects, including being a co-maintainer of Drupal Commerce. While mostly focusing on Drupal and PHP development, he created https://contribkanban.com, an AngularJS application, to provide Kanban boards for the Drupal community to collaborate with.